Wyberton Reserves' Reece Beauchamp gets some close attention from Skegness Town Reserves' Ben Etches. Spilsby Town Reserves lifted the Main RidgeTake Away Reserve Cup with a thrilling 3-2 victory over holders Swineshead Institute Reserves at Boston Town’s DWB Stadium last Tuesday night. This was the first of the Boston League finals for this season and both teams deserve credit for an enthralling game played out before a crowd of 250, and which was a great advert for local football. Having reached the final in their first season back in the Boston League, but having not won the Reserve Cup for 20 years, Spilsby Town were two goals to the good at half-time but had to withstand a spirited Swineshead fight-back in the second-half before grabbing a dramatic late winner. With an exuberance of youth in their ranks displaying great energy, Spilsby Town went on the offensive from the off and, after seven minutes, Louis Frankish saw a header brilliantly palmed aside by Ben Troops in the Swineshead goal. Swineshead then went close themselves as Giles Favell’s goal-bound header was cleared off the line by Spilsby captain Kris Cappelow. On 15 minutes Josh Smith weaved his way clear in the penalty area but scooped the ball over the Spilsby goal. However, three minutes later Spilsby took the lead as Troops parried a close range effort from Jay Adams but could only look on helplessly as Adams hooked the ball into the goal at the second attempt. On the half hour, Daniel Smith cut in from the left but again Troops was equal to the task saving at the foot of the post. Spilsby were not to be denied and added a second goal in the 35th minute as a shot from Travis Herberts rebounded from the crossbar and he reacted quickest to force the loose ball home. The second-half saw Spilsby start with more of the same with Herbert’s fierce free-kick tipped onto the bar by Troops and then Luke Odlin’s deliberate lob drifted wide of a post. However, on the hour, the impetus of the match was dramatically changed by the intervention of the irrepressible Josh Smith. First of all he cut the deficit with a far post header from a free-kick and 10 minutes later rounded goalkeeper Conor Carse and slotted into the unguarded goal to bring the scores level. With both teams now striving for the winner, Swineshead Captain Mark Ledger brought a good save from Carse and at the other end Adams dribbled along the bye-line only to shoot into the side netting. With six minutes remaining Spilsby delivered the telling blow as Adams broke clear and the young Swineshead goalkeeper advanced to block tackle him only for the ball to squirt into the path of Herberts, who unerringly rifled it into the beckoning goal to send the Spilsby players into ecstasy. The Man of the Match was awarded to Spilsby’s Jay Adams. Special praise must be given to 17-year-old referee Daniel Sharples, who handled the final superbly. The Cup and individual trophies were presented by Fred Hunt as guest of honour in recognition of his outstanding contribution to local football who, this season, is celebrating 60 years as secretary of Park United Football Club. Wyberton Reserves and Skegness Town Reserves served up a seven-goal thriller at the Causeway. It was Wyberton who were victorious thanks to a hat-trick from Shane Brackenbury in a 4-3 home win. Liam Shinn grabbed the other home goal while Skegness replied through Max Forman, Charlie Arabin and Josh Whittam. Kirton Town came up against one of the most potent strike forces in the Premier when they made the trip to Swineshead on Saturday. The home front was firing on all cylinders as Swineshead hit double figures without reply. Rob Masters, Bert Snaith, Mark Sharman and Jack Houghton were all amongst the goals in a 10-0 score-line. Snaith hit four while Houghton’s treble put Town to the sword. Masters’ double and another strike from Sharman saw Swineshead boost their goal average by some margin. Fellow strugglers Pointon looked to be heading for defeat when they entertained Billinghay Athletic as the game entered the final 15 minutes. Trailing 1-0, things didn’t look good for the home side until Jamie Andrews stepped into the spotlight. The striker’s timely hat-trick and another from Olly Cooper saw Pointon home with a 4-1 home win. Old Leake had a routine 3-0 home win against Fishtoft with Adam Abell grabbing two of the goals. Adam Tempest opened the scoring for Leake when he converted James Brader’s cross and Abell made it 2-0 before the break. Fishtoft enjoyed their best spell of the game during the opening 20 minutes of the second half, but couldn’t find a breakthrough. Abell secured victory with a third when he burst through before beating a defender and slotting home. Pete Orrey stepped in as match referee after the appointed match official failed to show. 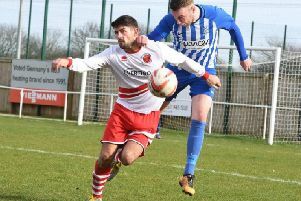 Heckington Millers gained sweet revenge when they entertained Ruskington Rovers last Saturday. Having lost to them twice already this season, the Millers were determined to put the record straight and, after a tightly contested first half, they took the lead with a neat finish from Dominic Kew, before Ruskington equalised midway through the first half and it stayed deadlocked at 1-1 at the break. Heckington knew that the next goal would be crucial and they went onto produce probably their best football of the season. They sunk Rovers with three goals within the first 10 minutes of the second half. Kew scored his second, Joe Braithwaite headed in at the back post from a delightful Kane Brown free kick and then Kew completed his hat trick with a left-foot finish which curled into the far corner. The game was all but over as a contest but they still conjured up two further goals with a fourth from Kew and a second from Braithwaite. Ruskington scored a late consolation to make the final score 6-2. Leverton sealed the Division One title with a hard-fought victory away at Old Doningtonians, although the hosts ensured that the visitors had to work hard throughout. The Dons took an early lead before Joe Daubney hit a fantastic equaliser from 20 yards out. Leverton quickened the pace after the break and Nathan Rippin, on his 99th appearance for the club, slotted his side in front following a Ben Reeson pass before Dom Goddard headed in to make it 3-1. Joe Daubney put the seal on a great comeback with his second goal of the game and gave Leverton back to back league titles. Tom Bates hit a hat-trick for Freiston in their 7-1 home win against Wrangle. Perried Dale (two), John Rutherford and Troy Ayton completed the scoring for a rampant home side. Mareham United earned a point away at Coningsby Reserves following a 1-1 draw. Coningsby looked to be heading for victory following Danny Cottingham’s goal before a superb 30-yard strike from the left boot of Jonathan Barrs helped rescue a point for the visitors. Mareham produced their best team performance of the season and will be hoping that the boost will help inspire them to gain a long awaited victory during their last three games. Railway made hardwork of beating a resolute Pointon Reserves side, but a victory is all that matters at this stage of the season now. Railway went one behind following a defensive mix-up which let Pointon in to take an early lead through Chris Barnes. Railway then began to take control of the game with long spells of possession leaving Pointon struggling to get out of their own half but, despite this, Railway struggled to beat the Pointon keeper who put a string of fine saves together. Finally, on the hour mark, Railway made it 1-1 when a long goal kick was allowed to bounce in the Pointon box forcing a defender, who was put under massive pressure from Liam Nimmo, to poke the ball into his own net. The final half hour saw more of the same, but it took Railway until the final three minutes to seal a 2-1 victory when Billy Shinn drove home from the edge of the box. Fishtoft entertained high-flying Tetford and, in a game of very few chances, the defences were mainly on top. In the first half Fishtoft got on the front foot and created chance after chance, but with no real conviction in front of goal. Towards the end of the half a momentary lapse in concentration nearly cost Fishtoft a goal when Tetford had a goal ruled out for offside. The second half was very much the same as the first although Tetford did look more threatening, but it wasn’t until the 70th minute that they finally made the break through. Fishtoft began to look tired towards the latter stages and Tetford soon added another to make the final score 2-0. Park United and FC Kirton produced an evenly and keenly contested encounter and it was Park who opened the scoring after 35 minutes when Alex Limb slotted home following an sublime pass from Chris Wray. FC Kirton equalised just before half time with a thunderbolt of a free kick and the visitors took all three points when they caught Park on the break midway through the second half to score the winner and make the final score 2-1. Holbeach Bank went close to salvaging some reward at Graves Park against Kirton Town Reserves when they scored through Steve Parker but the home side replied twice to run out 2-1 winners. Kirton Town’s inspirational midfielder Robbie Sansam grabbed one of the goals while Daniel Lovelace hit the other. Spilsby Town Reserves proved too strong for Old Doningtonians Reserves when they recorded a 5-1 home win to boost their promotion hopes. Substitute Dan Smith struck two of the Town goals while Jay Adams and Matthew Upton also got on the score-sheet. The other came courtesy of an own goal, while the best goal of the game came from the visitors when Liam Barnett collected the ball in his own half before beating several defenders and scoring in style. While Town had a strong line-up, the Dons Reserves were not at full strength after they had to provide several players to their first team after a scheduled Grand National trip accounted for many players from their Division One squad being absent. A strong Friskney Reserves side held Wyberton A to a 2-2 draw. Niall Larkin and James Stubbs hit the Wyberton goals.